Udhiyah (sacrifice) is among the great rituals of Islam, which signify the Oneness of Allah, His Blessings, and Bounties. It reminds us the exemplary obedience of our father, Ibraheem (alaihi as-salaam), to His Lord and his great sacrifices to Him. Udhiyah encompasses much goodness and blessings and thus acquires a great deal of importance in the lives of Muslims. Hereunder is a brief look at the important rituals of Udhiyah. Scholars differ concerning the ruling of Udhiyah, some are of the opinion that Udhiyah is wajib or obligatory while others hold Udhiyah as a confirmed Sunnah. Allah says: "Therefore turn in prayer to your Lord and sacrifice (to Him only)." [Soorah al-Kawthar 108:2] This verse is a command and a command implies obligation. This opinion is based on the following Ahaadeeth. Conclusion: Shaikh Ibn Uthaymeen (rahimahullah) following his discussion of those who say it is obligatory and those who say it is a Sunnah said, "Each point of view has its evidence. It is safe for the one who is able to offer a sacrifice should not neglect to do so, because of what is involved in this act of reverence towards Allah, remembering Him, and making sure that one has nothing to be blamed for." The basic rule of Udhiyah is that sacrifice is required at an appointed time from one who is alive, on behalf on himself and on behalf of his household. He may also include in the reward all those whom he wishes, dead or alive. It is from the Sunnah that one includes his household living and dead in his Udhiyah. So, when he slaughters his sheep, he should say, "Allaahumma haatha 'annee wa 'an ahli baytee" meaning "O Allah! This is on my behalf and on behalf of my family members." It is from the virtues of Udhiyah that one animal is sufficient for one man and his family; he is not required to make separate sacrifices on behalf of every member (living or dead). With regards to Udhiyah of a deceased person, if he has bequeathed up to one third of his wealth for the purpose of sacrifice or included it in his waqf (endowment), then his wishes must be carried out. Otherwise, offering sacrifice on behalf of the deceased is a good deed and it is considered to be giving charity on behalf of the dead. 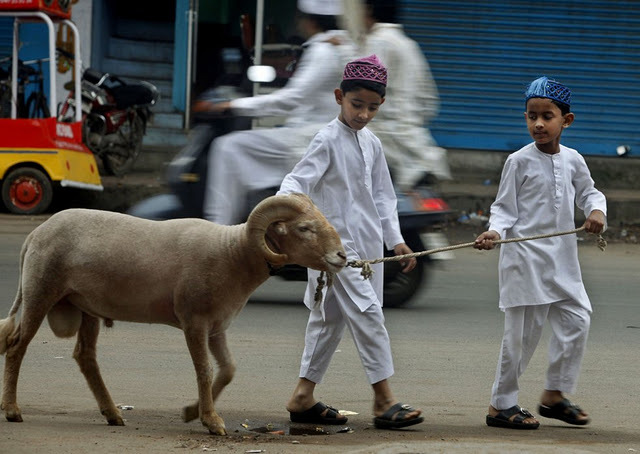 Animals prescribed for Udhiyah are camels, cattle and sheep. With regards to sharing a sacrifice, then a camel or a cow can be shared by seven people, this is based on the narration of Jabir (radhi allahu anhu), who said: "The Messenger of Allah (sallallahu alaihi wa-sallam) commanded us to share camels and cattle, each seven men sharing one animal." [Saheeh Muslim v: 2, p. 662, no. 3024] If a sheep, a goat or a ram is offered for Udhiyah, then sharing is not allowed, since no evidence is found in the Sunnah for it. It should be mentioned here that the scholars agree that sacrificing an animal and giving its meat in charity is better than giving its value in charity. The Messenger of Allah (sallallahu alaihi wa-sallam) chose to perform sacrifice and he did not do anything but that which is best and most befitting. This is the opinion of Abu Haneefah, al-Shaafa'i and Ahmad. This refutes the saying of those who say that today people need money more than they need food, therefore it is better to give the money rather then sacrifice an animal. From the conditions of Udhiyah is that the animal offered for sacrifice must have reached the required age, which is six months for a lamb, one year for a goat, two years for a cow and five years for a camel. The animal should be completely free of any faults because sacrifice is an act of worship and Allah is Tayyib and He only accepts that which is Tayyib. Milder defects do not disqualify an animal, but it is Makrooh to sacrifice such animals, for e.g. animal with a horn or ear missing, or an animal with slits in its ears, etc. Whoever honors the rites of Allah, this has to do with the Taqwa (piety and righteousness) of his heart. The Sacrificial animal is not for sale. It is forbidden to sell the animal chosen for sacrifice, except for a better exchange. If it gives birth to an offspring, the offspring must be sacrificed along with it. It is permissible to ride the animal. Prescribed time for sacrifice: The animal can be sacrificed after the Eid prayer and the Khutbah (not when the Khutbah or the prayer starts) until before the sunset of the last day of Tashreeq, which is 13th Dhul-Hijjah. Slaughtering the animal with one's own hands is better, but if one does not do so, it is Mustahabb (liked, preferable) for him to be present at the time of slaughtering. Selling any part of the sacrificed animal is prohibited: Scholars agree that it is not permissible to sell anything from the sacrificed animal's meat, skin or fat. We hope you benefited from this article. Please leave your comments below!